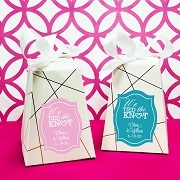 Cheers to the perfect personalized wedding favor with our 5.75 oz. 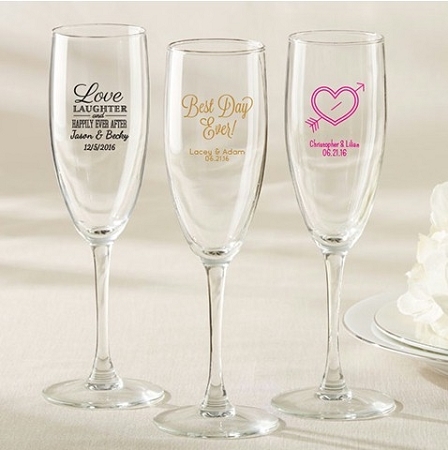 personalized wedding champagne flutes! 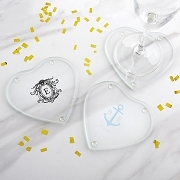 With a number of different imprint colors and designs available, chances are you'll be able to find one that is just right to fit into your elegant wedding decor. Great Quality for a decent price! I got the glasses monogrammed with some gold autumn leaves. Looks perfect. These came out amazing! 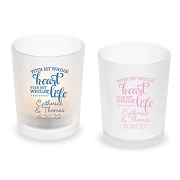 Peter the sales associate I worked with was great, we ended up ordering the wrong design and last minute had to rush order 50 new customized glasses. He got them ordered/designed/shipped to me with time to spare. 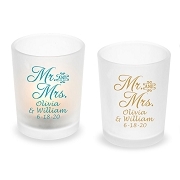 I ordered these flutes for my wedding with the mask design and our names. The website said it would take around 2 weeks to process and 5-7 days for the flutes to arrive, but they got to me in less than 2 weeks! When I opened them I was extremely pleased with the quality; the glass itself is very sturdy, the design is beautiful and not one of the flutes were flawed (also out of 100, none were broken!). Very pleased with my purchase!